The Brainwave Entrainment Audio contained herein is for tapping into the great Duke Agares. The frequency used is BETA and THETA with a musical accompaniment, which will hasten your mind for his conjuring and interaction. Herein is the Duke called Agreas, or Agares. He is under the Power of the East, and cometh up in the form of an old fair Man, riding upon a Crocodile, carrying a Goshawk upon his fist, and yet mild in appearance. He maketh them to run that stand still, and bringeth back runaways. He teacheth all Languages or Tongues presently. He hath power also to destroy Dignities both Spiritual and Temporal, and causeth Earthquakes. He was of the Order of Virtues. He hath under his government 31 Legions of Spirits. And this is his Seal or Character which thou shalt wear as a Lamen before thee. 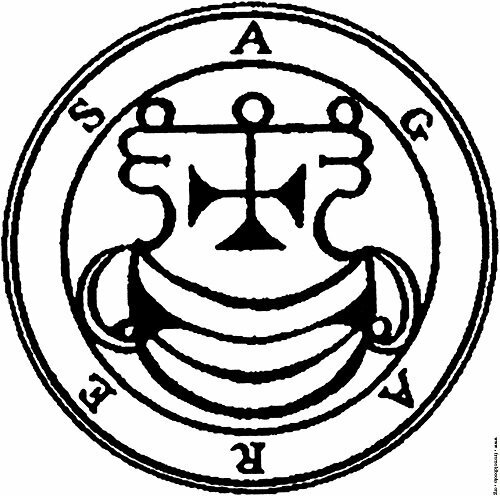 Duke Agares is mentioned in the Book of Incantations, The Discoverie of Witchcraft, The Magical Calendar, The Book of Spirits, The Book of the Office of Spirits, The Grand Grimoire, The Book of Oberon, Pseudomonarchia Daemonum, The Lesser Key of Solomon, Paradise Lost, and Dictionnaire Infernal.